Colleen McCullough was a prolific and renowned Australian writer. Her 1977 book ‘The Thorn birds’ went on to sell 30 million copies worldwide and it’s still popular today. It’s also been made into TV series. The successful book enabled her to give up her professional career in Yale Medical School where she taught neurology, to become a full time writer. 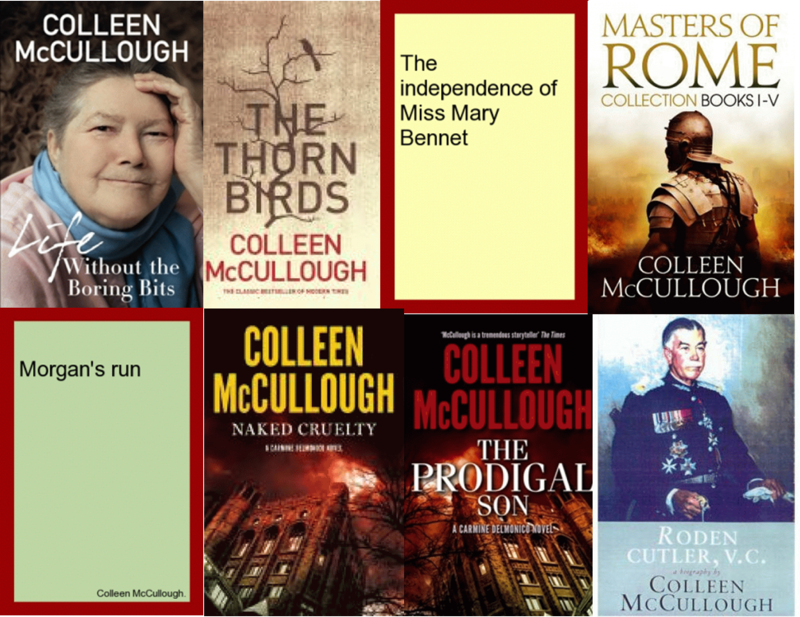 Colleen McCullough wrote more than 20 books across different genres. Her intensely researched series Masters of Rome in seven books that won her much acclaim, including plaudits from politicians including Bob Carr, Henry Kissinger and Newt Gingrich. There is also another series, Carmine Delmonico series, as well as a biography that all well received by her readers. It is an amazing life that we should admire and celebrate. Parramatta City Library has some McCullough’s books available for loan. This entry was posted in Australian Authors, Books to Screen, Fiction, Non Fiction and tagged Author, books, Colleen McCullough, Parramatta City Library, reading, Writer by admin. Bookmark the permalink.